Among all the marketing channels, the scope of web push Campaigns is massively broad. Most of the times, users access eCommerce sites on a web browser, and targeting them on this platform can win half the battle at the beginning itself. Web push notifications can deliver instant communication on any platform, at any time, through any site and with any level of customization. You can push an array of notifications to engage, re-engage, or even bring back the bounced visitors. 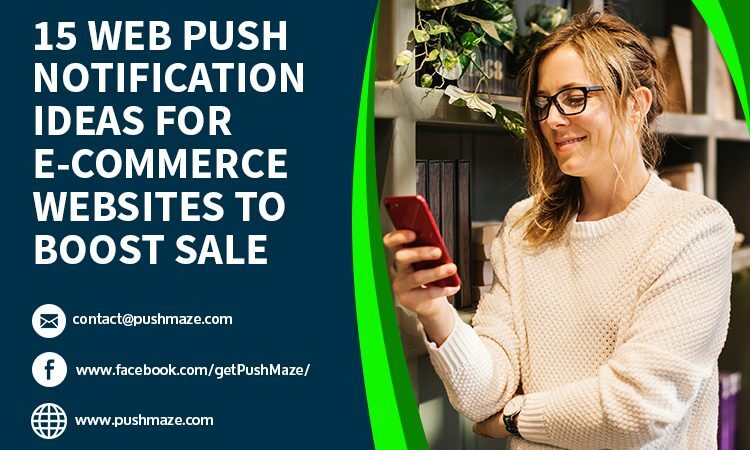 This Infographics will enlist fifteen web push notification ideas to boost your eCommerce sales. Please also check the explanation on each of the ideas at the end of the page. E-Commerce is a competitive market. If your product is out of stock, buyers can easily get it from another store with a few clicks. Let your customers know that the sale is limited and they will not get this product at a cheaper rate after the sale. Web push message is often the channel of choice for sending alerts, updates and recurring offers to the previous customers. Be advised that these subscribers are among the most loyal and active customers. If there is a possibility of re-engaging them, then the deal of the day is the best option. Sending out a web push alert for exclusive collections is a great way to give your savvy customers a positive shopping experience because it keeps them informed about unique products in your store. In addition, it keeps your business on top of their mind while thinking about high-class products. In some cases, a WOW moment will involve guiding a well-thought push campaign to increase loyalty and repeat business by selling gift-able products. Your rivals will try to win over customers with stale product listing, while you can do the same with similar products, but with a more personalized shopping experience like suggestions for best gift-able items. People often perceive push notifications as an intrusive annoyance. They might land at inconvenient times offering irrelevant and impersonal information. To avoid this, have a little check on your selection for the title casing. Be a little creative and push a dramatic flair that appeals to the user. Just think of it as– it is important to capitalize each word in the heading and description of the message. You might often find yourself either running out of stock for seasonal products or stocking more than what is required. Communicate your loyal customers that you have a limited stock of exclusive seasonal collections for them. By doing this, you will be able to sell out some highly wanted products and finish the stock at the appropriate time. After successfully setting up your affiliate system, everything would be ready to start promoting your new affiliate partners. You can promote your affiliate partners by pushing information about Coupon Portals, Price Comparison Engines or review websites. For example, you can push a YouTube link to a review video from your affiliate YouTube partner. Often times, gift-cards can be the best present people send to their local and distant acquaintances. If you offer gift cards, then remind your customers about the exciting deals are available on them. Moreover, if you do not have any such option available in your store, you should seriously consider integrating them. Urgency and scarcity are the most powerful persuasion secrets for getting people to act on your messages. Create a sense of urgency by letting them know about the limited time discounts in your store. Encourage them to buy their desired products before the offer ends. You can entice your prospects by announcing free- gifts with every purchase in your store. If you do not offer any such deal, then you may want to adopt one, or just push about any equivalent deal than you can afford to provide. The word ‘FREE’ itself can secure a massive click through on your push messages. It is hard to get loyal customers, and once secured, it could generate massive sales without spending on paid promotions. Push your customer loyalty program by sending exclusive offers and loyalty points to your frequent shoppers. You should push alerts about bestselling and trending products on your store too. By letting them know, what other shoppers are buying, you may achieve some instant conversions even with random products. Of course, you will be tracking their shopping behavior for guessing the products that might interest them. Sell beauty products online, and give customers unmatched ability to purchase all the products they need to feel beautiful. Pushing notifications about popular beauty products in your store will give them the ability to buy desired products without ever stepping foot outside their homes. By doing so, you can put your eCommerce store in front of new shoppers, thereby increasing sales and brand awareness. Even in the bestselling markets, it takes a lot to sell home décor products. The secret lie in offering a complete home makeover solution at a single place. You should push more than just the product suggestions. Give your subscribers the best tips to set up their dream home and offer ideal deals on related items. The protection plans and extended warranties provide great value to the customers if they are priced right and offer the coverage that the customer needs. Industry research says that 25% of customers who purchase from you will also purchase an extended warranty. You can push special promotions on the extended protection and encourage customers to invest in Protection Plans for a greater good. How bloggers use web push notifications to reach target audience?